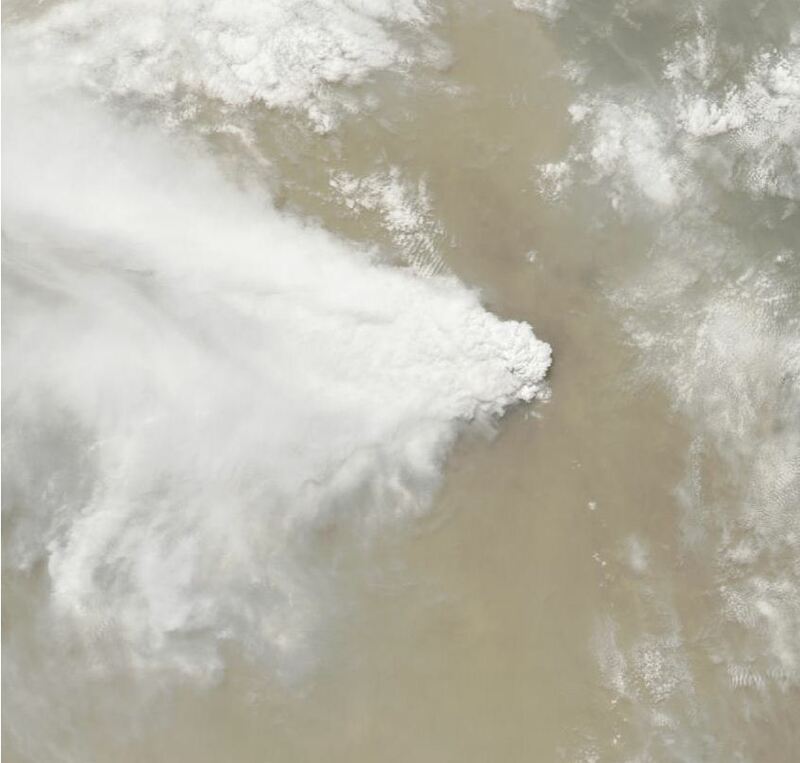 Dramatic satellite images of the Ethiopian eruption | Watts Up With That? 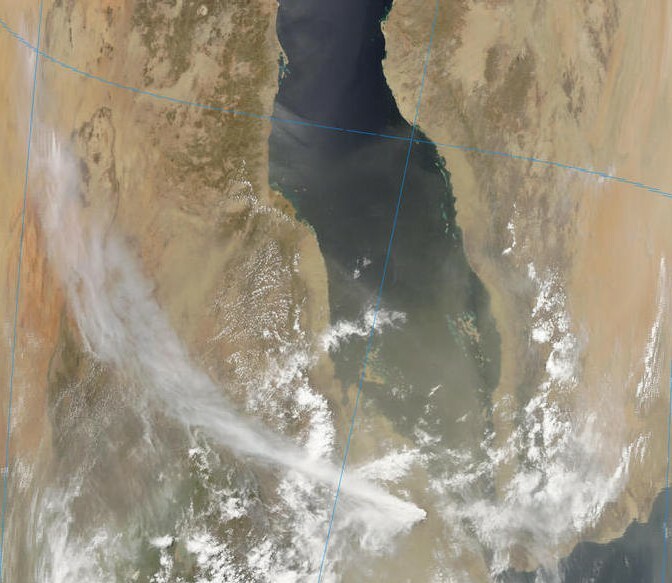 The MODIS/AQUA rapidfire website finally had a pass overhead online early this AM of the Ethiopian/Eritrean area volcanic eruption of Nabro, and I have them below. The plume stretches well over 1000 miles now. In the photo below, the Red Sea is prominent north of the volcano. The zoomed image below the “read more” line is quite dramatic. I’m sure we’ll have a sulfur dioxide estimate, and perhaps an ESA image of it in the next few days. 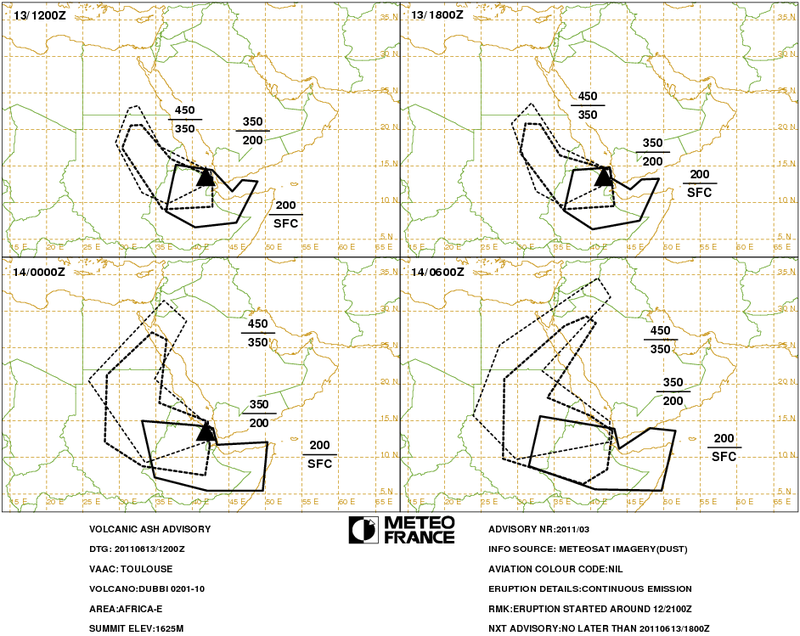 It appears that we are in quite an active period of vulcanism, with several eruptions worldwide in recent weeks. Looks like a Pinatubo redux. Equatorial SO2 has a pronounced effect. The length and volume of the eruption remains to be determined. This is a ROUGH estimate of the eruption size for Nabro and Puyehue-Cordon Caulle derived from VAAC reports and activity reports. The formula is from “A multidisciplinary effort to assign realistic source parameters to models of volcanic ash-cloud transport and dispersion during eruptions” Mastin et al (2009) and had an accuracy of a factor of four, either high or low. This is represented by the shaded area tracking with each curve. Over at the Smithsonian, their Nabro volcanism page shows “Unknown” as the last known eruption. Before this one, I presume. Nearly all this and lasts years tectonic activity is probably due to historic change in solar conditions. Gaia is angry! Better throw in some virgin climate researchers. Seriously, a quantitative comparison to the Pinatubo eruptions would be fascinating — and seeing a prediction based on them come true would be oh-so-sweet. Let’s beat the GCMs! Did Nabro purchase the appropriate carbon offsets to be able to release CO2 into the atmosphere? U.N. — get on that right now! 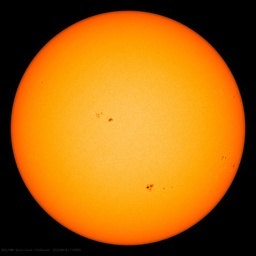 There has to be relationship to the activity of sun. We just don’t know how it works. Pierre Gosselin posted this about activity at the Ethiopian Erta Ale volcano in January (50 km to the West of the Nabro), referring to a Spiegel article. It mentions the breaking apart of the African continent in that area. We will see more of this. It looks like the ash is above the cloud deck. Any estimates as to the height of the erruption? I hope this is low sulfur SO2. While volcanoes are always erupting around the world, there are currently a couple of big ones going on. The Chile one has dumped a lot of SO2 and the Iceland one put material up to 50,000 ft. The Sun is sitting quiet and the AMO and PDO appear to be drifting negative. Then there is the record amount of snow that is still left in the mountains of the west, in many places where there should not be snow there is 10ft+ that is showing no signs of melting…. Anthony, the eruption is actually just over the border in Eritrea, not Ethiopia. Will this eruption have an impact on the Atlantic hurricane season seeing as that ash will likely be carried by the trade winds over the Atlantic at some point. Was this in the models? Guess who is/was in Ethiopia.U.S. Secretary of State Hillary Clinton . Heh, Hillary is leaving Ethiopia early due to the ash cloud. Obama had to leave Ireland early due to the most recent Icelandic one. What is it with these people and volcanoes? Volcanoes like this provide an opportunity to test climate sensitivity. Climate models assume a very high sensitivity to radiative forcing and typically predict considerable cooling from a large volcanic eruption. However the measured cooling subsequent to a volcanic eruption is typically much smaller, suggesting a lower sensitivity. It will be very interesting to see whether this will happen again. Effects of Volcanoes . . . are included in my “model” . . . .
You might want to wave the ‘virgin’ requirment. There probably aren’t any doing climate research. The MSM is still quiet as a mouse on this. is “explained” by “natural variation”. There is no need to look at the volcano as the source of the cooling. After all the cooling, if it occurs, will be within the range of “natural variability”. Nothing here to see, the earth cools all the time. 2. If a model successfully predicts this cooling, there is also no point to that. Chaos rules and that means we can say nothing about the trajectory that external forcings have on the system. Heck, even if the sun were to double its output we cannot predict that it will get warmer, because well, Chaos rules. Must be all the extra surface heat from anthropogenic CO2 is softening up the hardened-lava plugs atop the world’s volcanoes making them more likely to pop. SNL will eventually find climate boffins and CAGW to be an inexhuastible supply of comedic material. Both the sun and volcanoes naturally vary in cycles. The interesting aspect of this is that they are part of the natural variations. Quick, we must stop this. The only way is to sacrifice somebody to the angry volcano gods. I nominate Hansen. Here’s a pretty thorough article about the Nabro eruption. Let them stay away from Yellowstone. Rbateman. You dont get it. Look at the temperature record. You see that dip around pinatubo? Now, let’s apply the skeptical logic to that. The first thing we will do is look back and see that these kinds of small dips occur ALL THE TIME. And so if we apply the Willis and Smokey Null, we will conclude that there is nothing special about this dip. Nothing here to explain that is not explained by the blanket statement “natural variation”. And if somebody says, it’s due to a volcano, we can merely say, that this dip is nothing special and needs no explanation. If we explain that the dip is small BUT can be explained by radiative physics, and if we show you models that simulate the effect, then if people were consistent they would complain about using models to show this kind of thing. If the model predicted .3C of cooling and we only saw .2C of cooling, people would argue that the models are falsified. As the sun varies, and volcanos vary, so too do GHGs vary. All the variation is “natural”. There isnt a supernatural cause of varying GHGs. Geology, Chemistry,Biology all drive the GHG content. One of those natural factors is MAN. Man changes the makeup of the atmosphere. the makeup of the atmosphere is a contributor to the surface temperature. That temperature changes naturally. The natural causes, man, the sun, volcanos, are hard to isolate and quantify because we cannot perform controlled experiments. But we do know that volcanos cool the planet cooler than it would be if they didnt block the sun, and we know that GHGs warm the planet warmer than it would be if they didnt raise the effective radiating height. The problem with a best guess, is that it’s still a guess. That all other things considered, CO2 will cause the world to warm is not doubted. The question is, once you take into fact the inconvenient truth that all other things are never equal, what is the likely warming caused by CO2. Warmists like to assume that the world is dominated by positive feedbacks, hence the claim that the total warming will be more, sometimes much more than the warmer by CO2 alone. Unfortunately again, there is no real world evidence showing that this assumption is true. In fact all actual, real world, studies that have been done to date, show that the planet is dominated by negative feedbacks, which would mean that the total warming will be less than the ~1C warming predicted by Arhenius’s equations alone. Pinatubo was a net -2.5 to -3.0 W/m2 (nobody can quite agree on the number so close enough) and temperatures fell by -0.5C. Doubled CO2 produces +3.71 W/m2 and is supposed to increase temperatures by +3.0C. The above link is an image of the plume i just viewed in LST. Am I reading that graph correctly? The legend below the graph suggests the plume from Nabro is -30 Celsius? Yes, that is your best guess. The problem is that the guess is demonstratively a load of dung. Everyone knows, even you. It was funny for awhile, but now it is rather sad. Please quit peddling the pooh. What’s the VEI rating on this one? If Mt. Nabro becomes an ultra-Plinian eruption it may depress temperatures over the next year or so. However, it may also increase the chances of the onset of another El Nino in 2012-13. I get the law of diminishing returns. For each doubling of CO2, you get a fraction of the previous increase. Anyway, the biosphere is going to eat it. I suppose this might not be true on a Planet without life to consume CO2 (that originally came from biomass that had ample CO2 as part of it’s food supply). I have seen that current CO2 in the atmosphere is at about 390 ppm. When can we expect it to reach 780 ppm? Will this be from using coal (now unpopular) or oil (now said to be running out)? There are various gases (some natural, some converted in some manner from non-gas sources). I’m just wondering as to the where, when, and how this 780 ppm will come about. We here in New Zealand are now having planes grounded – by the Chilean eruption. The ash has travelled right around the globe to muck up our skies. What with that and yesterdays earthquakes (now rated 6.3 and 5.7 and both very close to Christchurch) we feel that nature really has got it in for us! It’s headed straight for Libya and Moamar’s place. For the MSM not to notice this amounts to sleepwalking. Buenos Aires – A volcanic ash cloud in Chile delayed flights across South America and Australia on Monday, stranding thousands of travellers and forcing UN chief Ban Ki-moon onto an overnight bus. Hilary Clinton have to redirect her trip due to the Nabro Eruption. Barrack Obama had to hide tail and run from the Icelandic eruption. Seems Ban Ki-Moon wasn’t as lucky. He got grounded due to the eruption in Chile. It really is scandalous that we spend untold billions on climate science, much of it of dubious value. Yet we know almost nothing about this volcano which could dramatically impact the climate. The reality is we are one large volcanic eruption away from millions dying in a worldwide famine. What is it now, 4 major eruptions this year? Iceland twice, Chile and now Eritrea? Quiet sun, early winters, early snow, are we hedding for a painfully obvious change in climate not at all driven by emissions of CO2 from human activities? Accoring to the Emirates operator I spoke to today, flights south to Addis Ababa are being affected. No more detail than that, and it could be inaccurate. Given the widespread lack of good governance in Africa I often wonder about the devastating impact a large volcanic event would have on the population here. At the moment much of Africa is fed by and has medical services provided through aid. In the event of a couple of poor growing seasons the ensuing famine would be appalling. African governments generally are unable to keep their population safe even during normal times. The onset of volcanic winter would be devastating. The cooling climate added to volcanically induced crop failure will overwhelm many countries but even moreso where good governance is absent. Flights are affected in the region. Actually, our best guess is 1.2K for a doubling of CO2. Another important point to be inferred form thePinotubo eruption is that climate science once again got a relationship backwards. While temp increases the capacity of air for water vapor, light incident on bodies of water and wet soil drive actual evaporation. Researchers accounted for the drying of air caused by cloud formation, but most of the water vapor decline was likely due to increased cloud cover over oceans reducing this heating mechanism, not the temperature change itself. Ethiopia/Eritrea is a very active region with fascinating geology. The Afar region, and it;s peoples, are remarkable. Proves, without doubt, humans can survie almost anywhere, even without modern technology. Flights in to/out of region seriously disrupted in the entire region. What a ridiculous argument. Nobody has ever claimed that there are no forcings on the climate system. What is claimed by sceptics is that the magnitude of the forcing attributed to anthropogenic CO2 has been grossly over-exaggerated. Here is a neat website to check out. Its an ash tracking site out of the U. of Alaska, Fairbanks. “Heck, even if the sun were to double its output we cannot predict that it will get warmer, because well, Chaos rules”. Congradulations Mr Mosher on the all time strawman. Of course your entire statement was a strawman, and the poorly understood feedback mechanism, of clouds and the sun may well explain a great deal of variation in climate. In regard to the IPCC claimed 3.5 degreees warming per doubling, this is looking less and less likely all the time.. This plume never reached the stratosphere. The tropopause is defined as where the temp inversion begins at the top of the troposphere. The plume reached between 13-14 km. At that latitude, the tropopause is usually around 17-18km (around 9-10km in the high latitudes) You can check skew plots for the world at this site. Text file is easiest to read. Just set your parameters, and then click the site on the map. If you pull the charts from Abha, Saudi Arabia(OEAB), just to the north of the eruption, for around the time of the eruption, you’ll see what I’m talking about. Winds were running from the ESE at 30-40kts at the plume height (50+kts at 15km) which is why it spread so fast to the WNW. Just came across this site. 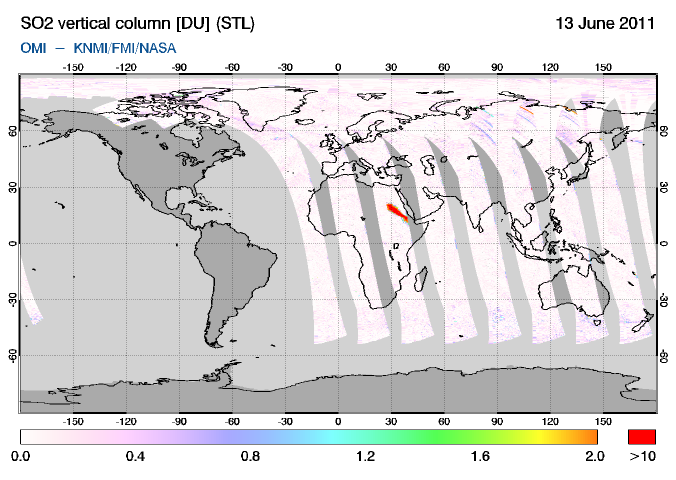 Good one to use to see if an eruption hit the stratosphere or not at the latitude its at. Here’s a chart that someone drew up from another blog I visited. Its a pretty good reference as to where the stratosphere is in relation to latitude. It will vary some, though on a daily basis, especially in the higher latitudes. 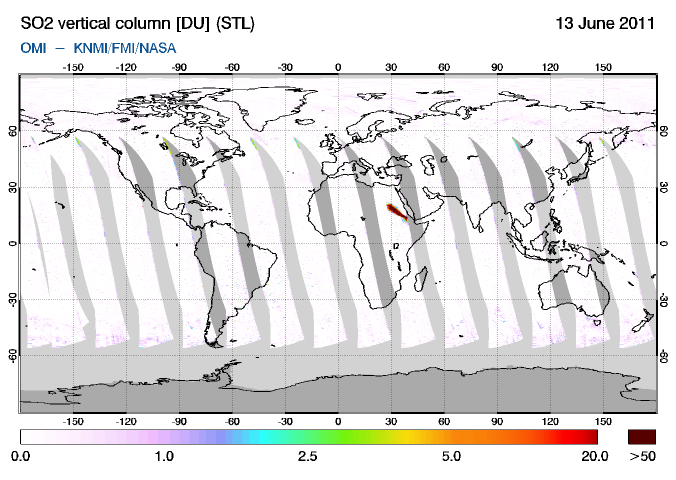 See http://sacs.aeronomie.be/nrt/NRTimg/gome2_vcd_NRT_000_lr.gif for a 24-hr composite near-real-time plot of vertical column SO2. Or there are any error in satellite image? Yeah, a SO2 rich volcano. Nothing into the stratosphere, though. There was another healthy eruption today. Fantastic NASA image of Nabro eruption showing lava flow. Any word on how long this eruption will last?